Contre Jour is yet another wonderful iPhone game from brought to us by the wizards over at Chillingo. The game contains the same addictive gameplay style that are characteristic of many games from the productive iOS publisher and is made even more impressive by its lush atmosphere, soothing background music, and easy-to-learn game style. Perfect for bite-sized gaming sessions, Contre Jour suits the platform well. The touch controls are friendly and intuitive, and there is plenty of content to keep players coming back. And though the game is a bit derivative in both style and gameplay, Contre Jour does plenty to stand on its own as a fun and challenging brain-teaser. 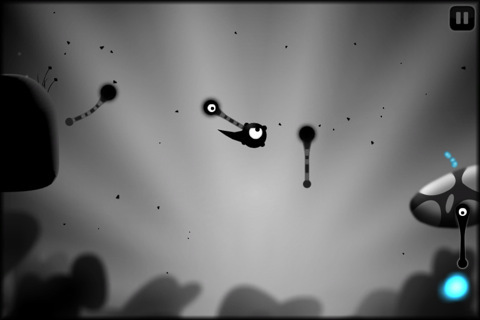 In Contre Jour, the object is simply to get your little black blob from the start of the level to the goal. Unfortunately, you cannot directly control your blob, and in order to achieve your objective, you must manipulate the environment and objects surrounding the blob. For example, at the beginning of the game you’ll cause your blob to roll in a certain direction by raising or lowering the ground beneath. As you move on, you’ll be able to attach the blob to objects, causing it to swing in one direction or the other. As make your way to the goal, you’ll get extra points for gathering items that are strategically placed throughout each level. Collect all the items and you’ll achieve perfection for that level. In order to unlock later levels, you’ll need to score as highly as possible on earlier levels; a characteristic that you’ll be familiar with if you’ve played other Chillingo titles. 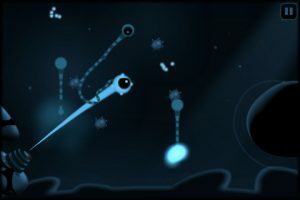 In all, the gameplay is quite satisfying and challenging in Contre Jour, though more experienced gamers may quickly see similarities to other popular titles like World of Goo or Spoing. 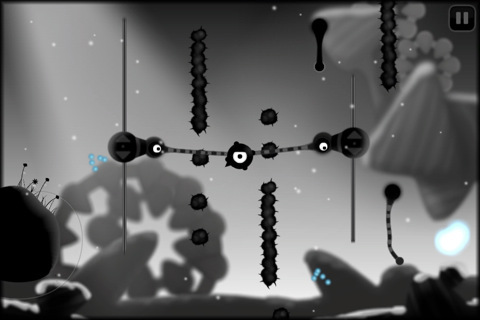 That’s not to say Contre Jour isn’t a game that merits attention if you’ve played the others. Just don’t expect a completely new experience. Fortunately, Contre Jour has other strong characteristics that help it to stand out. The soundtrack is soothing and fits the mood of the game quite well. The game opens by suggesting you wear headphones to get the most out of the soundtrack, and it’s a good suggestion. Furthermore, the almost silhouette visual style of the game, while popular in many games these days (ie: Limbo), is very well executed here and combines nicely with the soundtrack. Bottom Line: Though slightly derivative, Contre Jour is a wonderful handheld title that fits perfectly on the iOS platform. 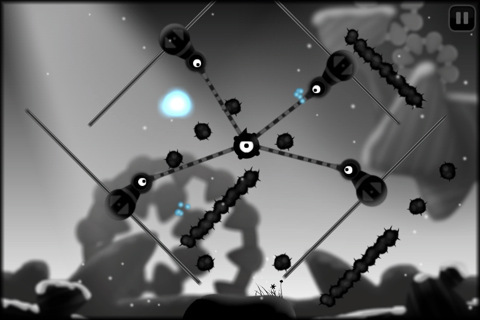 Contre Jour is compatible with iPhone, iPod touch, and iPad. Requires iOS 3.0 or later.